My Take on it – Ever since I saw Steve McQueen in The Great Escape (1963), I’ve always been a fan and little by little, I’ve seen more and more of his films over the years. I finally got a chance to see this one. I must admit, that I wasn’t the biggest fan of this one and it by far isn’t one of my favorites with McQueen. The storyline was quite thin and I didn’t like that there were too many unexplained coincidences that helped the plot move along. 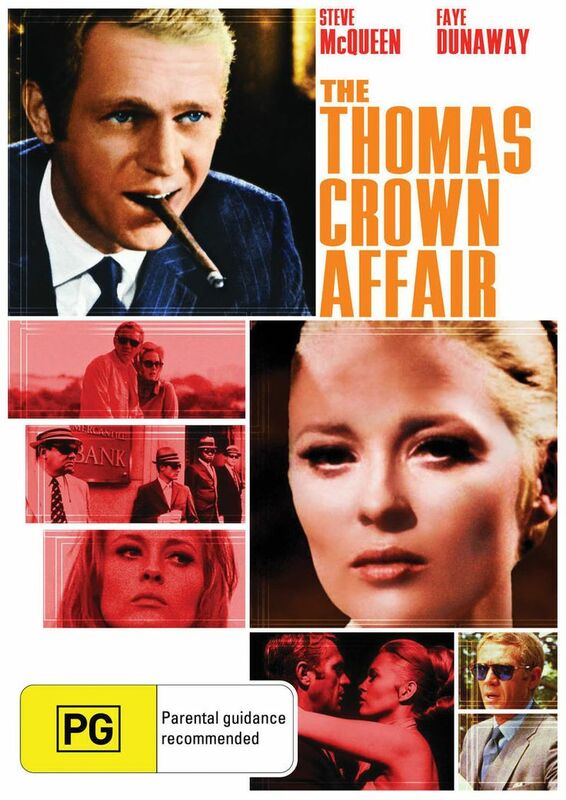 McQueen and co-star Faye Dunaway have nice chemistry together, but that’s the most praise this movie can get because it feels too average. The split screen concept was utilized well here because it gives us the sense of so much more going on all at once. The concept in general works, but the execution is quite flawed. This is probably why it was remade with Pierce Brosnan in 1999 and a new remake is in the works. Bottom Line – Not my favorite McQueen film. The plot is too simple and there are too many coincidences that aren’t explained well enough. The split screen usage is done well because it gives us a feeling that much more is happening in short spans of time. Chemistry between McQueen and Dunaway works quite well. Concept is good, just poorly executed.